Welcome to Sunshine Billiards. Manufacturer and Supplier of Pool and Game Tables . The company was established in 2011 at Mumbai. We export to East Asia, Middle East and other countries. Immense domain experience and Assured quality products help us to serve Clientele like CSML, Hutchison Global Services and many more. Our product list covers Pool, Luxury Pool and Traditional Pool Tables. We are offering an attractive collection of Billiard Tables Accessories, Snooker Billiard and Regular Pool Tables. 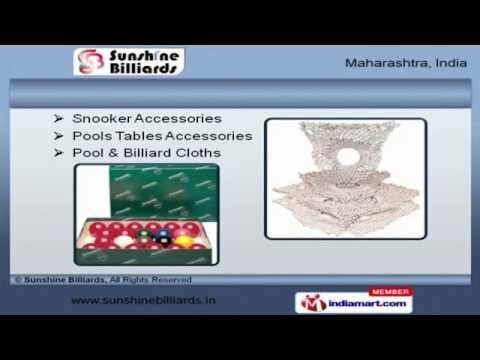 Our Billiard Cloths, Snooker and Pools Tables Accessories are widely appreciated in the market. We also provide Billiard Bridge Heads, Table Tennis and Air Hockey Tables that are extremely reliable. Avail from us, a classic collection of Soccer Tables, Lights and Cue Racks. Our Leg Levelers and Novelty Items are reckoned all over the world for their superb quality.